This paper discusses the early development of radiation applications and radiological physics in medicine world-wide in general, and India, in particular. 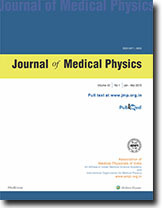 The paper presents the growth and current status of these applications, with special reference to medical radiological physics as a profession in India. Patient dose verification is clinically one of the most important parts in the treatmerit delivery of radiation therapy. The three dimensional (3D) reconstruction of dose distribution delivered to target volume helps to verify patient dose and determine the physical characteristics of beams used in IMRT. Here we present Beam Intensity Scanner (BlnS) System for the pre-treatment dosimetric verification of two dimensional photon intensity. The BlnS is a radiation detector with custom-made software for dose conversion of fluorescence signals from scintillator. The scintillator is used to produce fluorescence from the irradiation of 6 MV photons on a Varian Clinac 21 EX. The digitized fluoroscopic signals obtained by digital video camera based scintillator(DVCS) will be processed by our custom made software to reproduce 3D- relative dose distribution. For the intensity modulated beam (lMB), the BlnS calculates absorbed dose in absolute beam fluence which is used for the patient dose distribution. Using BlnS, we performed various measurements related to IMRT and found the following: (1) The 3D-dose profiles of the lMBs measured by the BlnS demonstrate good agreement with radiographic film, pin type ionization chamber and Monte Carlo simulation. (2) The delivered beam intensity is altered by the mechanical and dosimetric properties of the collimation of dynamic and/or step MLC system. This is mostly due to leaf transmission, leaf penumbra, scattered photons from the round edges of leaves, and geometry of leaf. (3) The delivered dose depends on the operational detail of how to make multileaf opening. These phenomena result in a fluence distribution that can be substantially different from the initial and calculated intensity modulation and therefore, should be taken into account by the treatment planning for accurate dose calculations delivered to the target volume in IMRT. In the western countries cobalt-60 machines have become obsolete, whereas in India we have about 250 machines operational for clinical radiotherapy. The basic differences of '6 MV x-ray beam' and 'cobalt-60 beam' are :- a) build-up dmax point, b) flatness of beam at depths, and c) sharpness of the beam edge. We looked at the homogeneity of delivered dose in the target volume in a 3 field SAD technique for 60Co (80 cm, 100 cm) and 6 MV treatments. More dose variations are seen in 60Co treated volume. The excess curvature of isodose curves of 60Co at depths may be one of the reasons for this in homogeneity in dose to target volume. Therefore, there is need for achieving perfect flatness in the isodose curves at desired depths. Radiation treatment with catheter based P emitters to prevent restenosis following angioplasty is currently under clinical trial in our institution. Since the treatment distance is 2.5 mm to 4.0 mm from the center of the source, gel dosimeter, together with nuclear magnetic resonance (NMR or MR), is the most suitable dosimetry system for intra-coronary sources. This is because gel dosimetry has very high resolution and is the only means to obtain three-dimensional dosimetry. A preliminary study was carried out with ferrous gel to determine the length and uniformity of activity distribution of the 90Sr/90 Y source of Beta-CathTM system used for intracoronary brachytherapy. It was found that the active length of the source, as measured with the prepared ferrous gel was 39.46 mm as against the specified length of 40 mm resulting in a variation of - 1.35% with that specified. From the profile obtained along the radial direction of the source, it was found that the 50% width at half maxima was 3.8 mm. Presence of alpha emitting radio nuclides inside the human body is very harmful to the normal tissues because of high attenuation powers of these radio nuclides. The amounts of alpha emitting radionuclides in the blood of a group of cancer patients and a group of non-cancer patients have been measured in a small number of Bangladeshi people. Solid State Nuclear Track Detector (SSNTD) has been used to estimate alpha tracks, which are counted by a binocular research microscope at a magnification of 450 (45'objective and 10 'eyepiece). All samples have been taken in separate airtight glass vials. For each sample, proper background correction was performed. The average track density in the blood of the cancer patients has been found almost double to that of the normal people. A method has been developed to predict Central Axis Percentage Depth Dose Distribution (CAPDD), using buildup factor concept of radiation transport studies in infinite medium. This concept has been applied successfully for finite medium in the case of 60Co beam and high energy x-rays. The predicted and measured values, which agree within +3% are presented here.